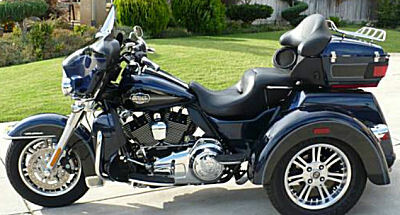 The 2012 Harley Davidson Trike for sale is in GORGEOUS used condition with a two-tone (2 tone), blue metal flake paint scheme. It has a 103 motor, reverse, cruise control, radio system and fully loaded for the money. This nice three wheeler has got it ALL in showroom condition and is still under warranty! And the three wheeled 2012 Harley for sale has only 15500 MILES! Thanks for visiting GoGoCycles Used Motorcycles for Sale and for taking a look at my 2012 Harley Davidson Trike. The location of the used trike for sale is Fresno CA California near Los Angeles CA and in my opinion my asking price for this motorcycle is cheap enough that it can't be beat on Craigslist or in an Ebay auction; only $29500 should get you years and years of riding pleasure. If you want to take a look at the trike for sale or have questions, call me (NO EMAILS)Gary 559-392-4two88 for more information and don't forget to mention that you found this ad on GoGoCycles Used Motorcycles and Parts for Sale www.gogocycles.com.